“Zion said, The Lord hath forsaken me, and my Lord hath forgotten me. Can a woman forget her sucking child, that she should not have compassion on the son of her womb? yea, they may forget, yet will I not forget thee. Behold, I have graven thee upon the palms of My hands; thy walls are continually before Me” (Isa 49:14-16). How often, in our distresses and difficulties, we think that the Lord has forsaken us and forgotten us! In the above text the Lord wants to show how much He cares for us and watches over us. “Can a woman forget her sucking child?” Some mothers may forget their grown up children at times but hardly any mother can forget her sucking child, as the child is helpless without her. But the interesting truth the Lord reveals here is that even if the mother forgets her sucking child, and does not show compassion on it, He will never forget us. In another place He promises, “The mountains shall depart, and the hills be removed, but My kindness shall not depart from thee” (Isa 54:10). How mindful the Lord is of those who cling to Him, of those who trust Him like a baby does! “I have graven thee upon the palms of My hands.” We can always see what is written on our palms, unlike something written anywhere else. The Lord wants to assure us that just as a name that is engraved on the hand of a person is always before his eyes and therefore cannot be forgotten, He cannot forget us. Our names are not simply ‘written’ but ‘graven’ upon the palms of His hand. It is very painful to engrave something on our hands and whatever is engraved cannot be easily erased either. So one loves very dearly, the person whose name is engraved on one’s hand. How much the Lord must love us then! “Thy walls are continually before Me.” The Lord has promised that He will be a wall of fire around us. The Lord not only sets a wall of fire around us, but He is also watching over the wall so that no enemy may penetrate the wall. If there is a wall of fire around you, the enemy cannot penetrate it; he will be consumed in the fire if he tries to! Oh dear child of God, you are well protected, well cared for by the Lord. 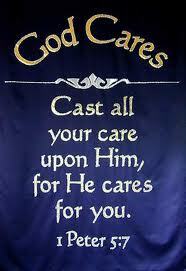 So cast all your care upon Him. “If the Lord careth for thee, be thyself at rest,” said Archbishop Lieghton.